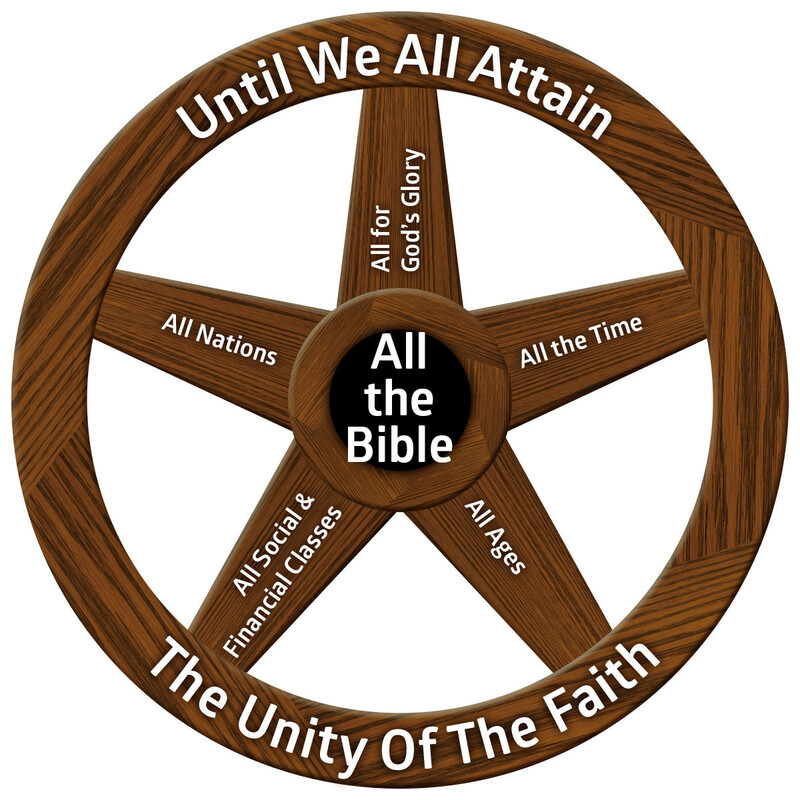 The wagon wheel represents our vision and commitment to maintaining and increasing unity within the body of Christ. Ephesians chapter four explains that one of the church’s functions is to equip believers to carry on the work of Christ “until we all attain to the unity of the faith” (Ephesians 4:13). We believe that the church will have a greater impact in our community for God’s glory as we grow in unity. 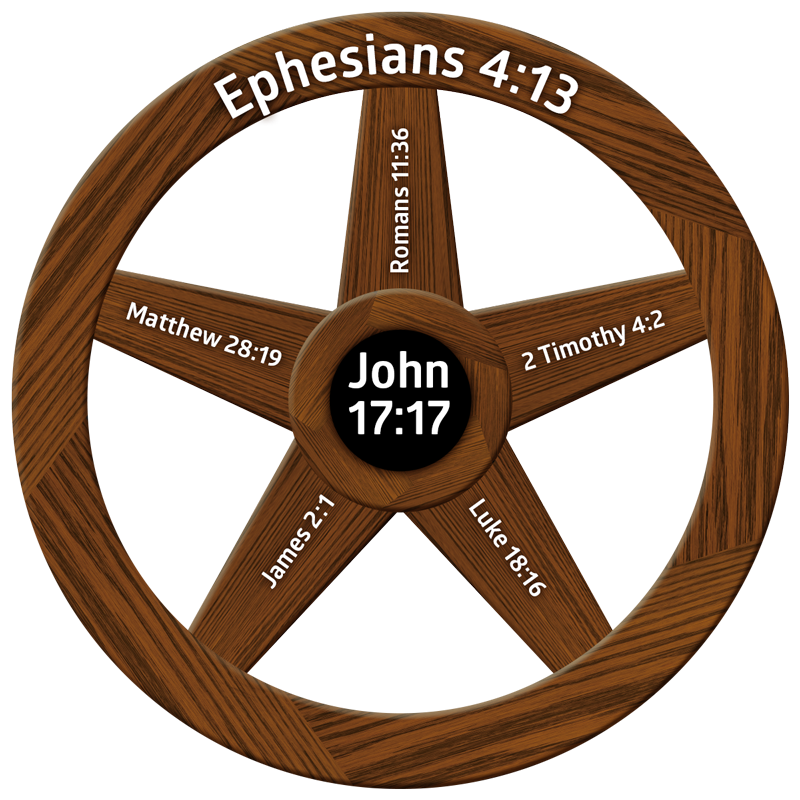 The center of the wheel highlights our commitment to teaching and believing all of the Bible. Jesus prayed that His Father would sanctify the church in the truth, “Thy word is truth” He said (John 17:17). We believe that He was referring to the entire Bible. God’s word is very clear regarding itself, that all scripture is inspired by God and all scripture is profitable for teaching, training, and correction (see 2 Timothy 3:16-17). Jesus made it very clear how God feels about children (Luke 18:16). And throughout the Bible, God calls for His people to esteem and respect the elderly (Proverbs 16:31). Therefore, we believe that it is vital to our vision to reach all ages with all of the Bible, all the time. Since we believe all people are of immeasurable worth to God, and that Christ’s death on the cross was not limited to certain economic or social classes of people, it is therefore our vision to reach out to all social and financial classes of people. Society may categorize people regarding classes, but the church should never show such favoritism. “My brethren, do not hold your faith in our glorious Lord Jesus Christ with an attitude of personal favoritism”(James 2:1, see also verses 2-5). God’s purpose in everything He does is to display, uphold, and protect His glory. We believe this was His purpose in creation and redemption. Our vision as a church is to grow in our understanding of His glory, and to do everything to exalt His glory (see I Corinthians 10:31).